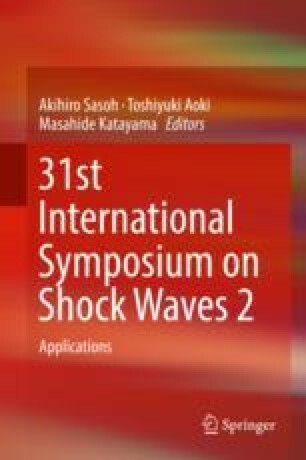 This paper reports that the presence of liquid impurity significantly affects the shock wave structure induced by laser-induced gas breakdown in a quiescent gas. A spherical blast wave is formed when there are no suspended liquid particles, whereas an elliptic shaped blast wave appears in gas breakdown with the presence of suspended liquid particles. The elliptic shaped blast wave has a higher overpressure magnitude on the perpendicular axis of the laser path. We would like to dedicate this paper to Prof. Margaret Lucas at the University of Glasgow for her kind arrangement of the usage of the high-speed camera and to Dr. Richard Green at the University of Glasgow for setting up the laser facility. This research work was supported by European Commission, H2020-MSCA-IF (Project reference: 654318). The laser facility was supplied by National Wind Tunnel Facility project (EPSRC grant number: EP/L024888/1).